Introduction: The styloid process of temporal bone is a bone projection that come form stylopharyngeal, styloid and styloglossal muscles. 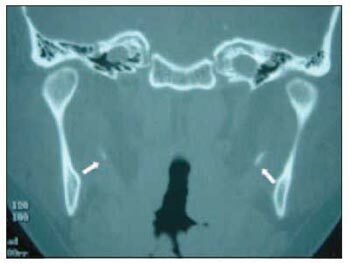 The Eagle's syndrome is characterized by presence of symptoms such cervical pain, dysphagia, odynophagia, otalgia, associated an enlarge of styloid process more than 30mm. Objective: To present three patients with Eagle syndrome and discuss clinical presentation and treatment of disease. Report of Cases: Related three cases of patients with symptoms and radiologic signs compatible with diagnosis of Eagle's syndrome than were submitted to surgical treatment by cervicotomy with full remission of symptoms. Conclusion: The surgical treatment with part of resection of styloid process is connected with remission of symptoms in patients with diagnosis Eagle's syndrome. The high cervicotomy approach determines adequate exposure of styloid process with more complete resection and protects neurovascular structures. Styloid process of the temporal bone is a 25-30mm projection of the bone corresponding to where stylopharyngeal, stylohyoid and muscles originate (1,2). The structures as superior constrictor muscle of pharynx; pharyngobasilar fascia; interior jugular vein; internal and external carotid artery and glossopharyngeal, vagoglossopharyngeal accessory and hypoglossal nerves are placed in the middle of the styloid process(1). Eagle syndrome consists of the presence of symptoms as cervical pain, dysphagia, odinophagia and ear pain combined with a styloid process larger than 30mm (1). Such syndrome is classified into classic and carotid types (2-4). The former affects patients who had been tonsillectomized and with pharyngeal pain spread to mastoid area and worsened by deglutition movements; the latter affects patients with or without palatine tonsils, who present constant cervical pain spread along carotid area (3,4). Eagle syndrome can be caused by elongation of styloid process due to the ossification of a remaining cartilage of the second branchial arch or even by stylohyoid ligament calcification (1,4). Elongation of styloid process accounts for around 4% of the population (3), and from 4 to 10% of them may not present any symptoms (5,6). Pain in previous asymptomatic patients might be either related to trauma or tonsillectomy or degenerative disease of the styloid process (4). Differential diagnosis consist of inflammatory diseases of the pharynx, tumors, dysfunction of temporal-mandibular articulation and glossopharyngeal pain (1,7). The target of this study is to report three cases of patients diagnosed of Eagle syndrome and also to discuss clinical presentation and therapy. S.P.B., a 41-year-old female patient, Caucasian searched service complaining of foreign body sensation at the base of the tongue to the right, combined with mastication and ear pain to the right. Patient did not present previous history of tonsillectomy or cervical trauma. At the physical manipulation, it was found a type of bone-consistence bulging at the anterior pillar of the right tonsil bed, associated to mouth opening limitation. Computed Tomography (CT) of the base of the skull with three dimensional reconstructions showed thick and elongated styloid process - 50mm to the right (picture 1). Cervicotomy was performed by removing around 30mm of the styloid process (Picture 2). Patient condition improved in the first three months with total symptoms healing. Picture 1 - Computed Tomography (CT) of the base of the skull with three dimensional reconstructions showing the elongated styloid process to the right (white arrow). Picture 2 - Computed Tomography (CT) of the base of the skull with three dimensional reconstructions showing the shortening of styloid process to the right after surgery (white arrow). S.S.S, 38-year-old female patient, Caucasian, searched service complaining of foreign body sensation in the oropharynx for six years, combined with high cervical area pain, dysphagia, odynophagia and bilateral ear pain with more intensity to the right. Patient did not present previous history of tonsillectomy or cervical trauma. At the physical manipulation, it was found bone projection in the high carotid-jugular area and at the anterior pillar of the right and left tonsil bed. CT of the base of the skull with three dimensional reconstructions showed thick and elongated styloid process - 50mm to the right and left. 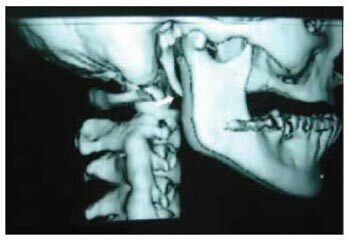 Cervicotomy was performed by removing around 30mm of the styloid process (Pictures 3 and 4). Patient condition improved in the first three months with total symptoms healing. Picture 3 - Computed Tomography (CT) of the base of the skull with three dimensional reconstructions showing the shortened styloid process to the right after surgery (white arrow). Picture 4 - Computed Tomography (CT) of the base of the skull with three dimensional reconstructions showing the shortened styloid process to the right after surgery (white arrow). V.T., 45-year-old female patient, Caucasian, searched service complaining of ear pain to the left for 5 years, combined with high cervical area pain and odynophagia. Patient did not present previous history of tonsillectomy or cervical trauma, however, reported fybromyalgia therapy. At the physical manipulation, it was found a bone enlargement at the anterior pillar of the left tonsil bed, and a painful (when hand-manipulated) bone projection in the high carotid-jugular area. Computed Tomography (CT) of the base of the skull and neck showed bilateral elongation of styloid process (Picture 5). Cervicotomy was performed by removing around 15mm of the styloid process from both sides. Patient condition improved in the first six months with total symptoms healing. Picture 5 - Computed Tomography (CT) of the base of the skull showing the process of the elongated styloid process to both sides (white arrow). 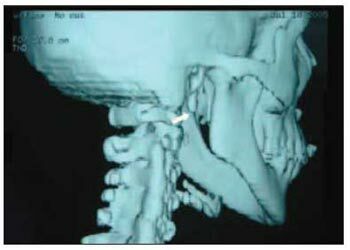 Eagle syndrome is characterized by the presence of pharyngeal-cervical symptoms combined with the elongation of styloid process (1,3). It is more common in females (4,8) aging from 30 to 50 years (1), and 50% of the individuals can be affected in both sides (8). In this study we have reported bilateral involvement in two out of the three cases. Diagnosis is based on clinical history and physical manipulation, and its confirmation depends on the imaging exam. The major symptoms are cervical pain; foreign body sensation in the pharynx; dysphagia; odynophagia and ear pain. 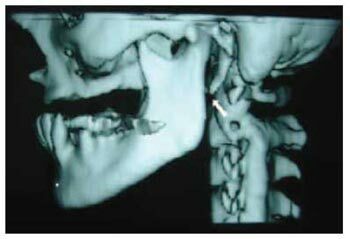 At the physical exam, the styloid process can be hand-manipulated as a firm resistance in the lateral wall of the oropharynx (tonsil bed). This procedure, which usually worsens pain and symptom healing after anesthesia in the tonsil bed, helps diagnosing the disease(4,8-18). The imaging investigation can be performed through cervical planigraphy (body-section radiography); side and anteroposterior skull radiography; mandible radiography; CT of the base of the skull with three dimensional reconstructions (4,8,11). Among all imaging exams, CT of the base of the skull with three dimensional reconstructions seems to be the most effective one, since it enables measuring styloid process length (4,8,11). The adequate length (25-30mm) inferiorly reaches the level of C1 and C2 articulation (10). CT of the base of the skull with three dimensional reconstructions of our first case shows a 50mm styloid process at the C2 and C3 articulation level (Picture 1). Clinical therapy may be performed through application of anesthesia or steroids in the tonsil bed; surgical therapy may be performed through intra-oral approach or high cervicotomy. Surgical removal is the most effective therapy for styloid process (2-4, 8), and if performed through intra-oral approach does not cause scars, though it presents contamination risks of the cervical space and vascular injury due to the difficulty visualization of adjacent structures to the process (4,9). High cervicotomy establishes better exposition, preserves nervous and vascular structures and enables more extensive removals of the elongated process (4,8). It consequently reduces morbidity rates, as seen through the approaches for the reported cases. The current patients presented complete symptoms healing with no complications from surgical therapy. In the follow-up after surgery of the two first cases, CT of the base of the skull with three dimensional reconstructions was done (Pictures 2,4), and it could be observed the apex of the styloid process at the level of C1 and C2 articulation. Surgical therapy by removing part of the styloid process is related to symptom healing of patients with Eagle syndrome. Cervicotomy establishes good exposure conditions of the styloid process with extensive removals of the nervous, vascular structures. 1. Mortellaro C, Biancucci P, Picciolo G, Vercellino V. Eagle`s syndrome: importance of a corrected diagnosis and adequate surgical treatment. J Craniofac Surg 2002; 13:755-758. 2. Eagle WW. Elongated styloid processes: report of two cases. Arch Otolaryngol 1937; 25:584-587. 3. Eagle WW. Symptomatic elongated styloid process: report of two cases of styloid process-carotid artery syndrome with operation. Arch Otolaryngol 1949; 49:490-503. 4. Bafaqeeh SA. Eagle syndrome: classic and carotid artery types. J Otolaryngol 2000; 29:88-94. 5. 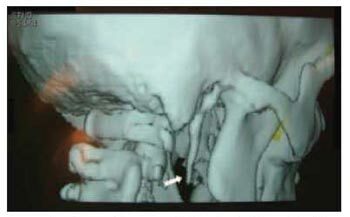 Murtagh RD, Caracciolo JT, Fernandez G. CT findings associated with Eagle syndrome. AJNR Am J Neuroradiol 2001; 22:1401-1402. 6. Restrepo S, Palácios E, Rojas R. Eagle`s syndrome. Ear Nose Throat J 2002; 81:700-701. 7. Soh KBK. The glossopharyngeal nerve, glossopharyngeal neuralgia and Eagle`s syndrome - current concepts and management. Singapore Med J 1999; 40:659-665. 8. Tiago RSL, Marques Filho MF, Maia CAS, Santos OFS. Síndrome de Eagle: avaliação do tratamento cirúrgico. Rev Bras Otorrinolaringol 2002; 68:196-201. 9. Beder E, Ozgursoy OB, Karatayli Ozgursoy S, Anadolu Y. Three-dimensional computed tomography and surgical treatment for Eagle`s syndrome. Ear Nose Throat J 2006; 85:443-445. 10. Lee S, Hillel A. Three-dimensional computed tomography imaging of Eagle`s syndrome. Am J Otolaryngol 2004; 25:109. 11. Sá ACD, Zardo M, Paes AJO Jr, Souza RP, Neto FB, Dreweck MO, Oliveira R, Neme MP, Rapoport A. Alongamento do processo estilóide (síndrome de Eagle): relato de dois casos. Radiol Bras 2004; 37:385-387. 1. 2nd year Resident Doctor in the ENT Service at HSPM - São Paulo. 2. PhD in Science by Post-Graduation program in ENT and Head and Neck Surgery at Universidade Federal de São Paulo - Escola Paulista de Medicina (Federal University - Medical School). Assistant doctor in the ENT Service at HSPM - São Paulo. 3. 3rd year Resident Doctor in the ENT Service at HSPM - São Paulo. This article was submitted to SGP (Publication Management System) of R@IO on April 16th, 2007 and approved on October 10th, 2007 at 10:18:34.